Naomie Harris started her career as a child actress, appearing on the children television series Simon and the Witch in 1987. She played voodoo witch Tia Dalma in the second and third Pirates of the Caribbean films, Selena in 28 Days Later, Winnie Mandela in Mandela: Long Walk to Freedom and Moneypenny in the James Bond films Skyfall and Spectre. In 2016, she starred in the critically acclaimed film Moonlight; a performance which earned her several nominations for Best Supporting Actress awards, including the Golden Globe, BAFTA, and the Academy Award. With the world’s attention and the glare of the media spotlight firmly on her, Naomie took the chance to talk about how she had taken time out to do the Hoffman Process – and the incredible impact the decision had provoked. 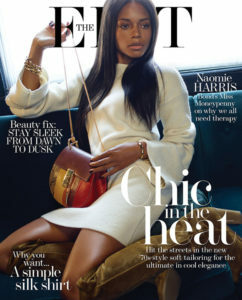 In a separate interview with More magazine, Naomie explained that she decided to concentrate on personal development several years ago, which led her to the Process. wellandgood.com: WTF is the Hoffman Process and why do celebs love it?